You are going to Watch One Piece Episode 381 English dubbed online free episodes with HQ / high quality. Stream Anime One Piece Episode 381 Online English dub A New Crewmate! The Musician, Humming Brook!Brook tells Luffy that he is glad to be alive and asks if he can join the crew, which Luffy approves of. All the Straw Hats are shocked by this, except for Zoro, who is sleeping, and Robin, who knew Luffy would accept him no matter what, but they nevertheless welcome him to the crew. 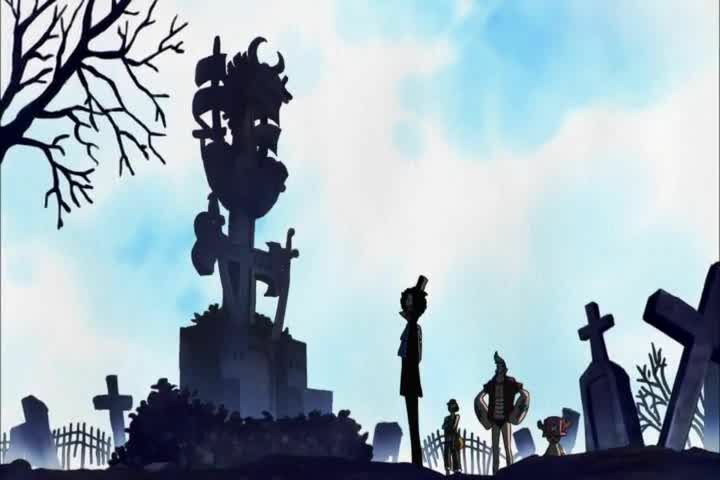 Two days later, Usopp and Franky make a grave for the dead Rumbar Pirates, and Zoro lays the broken Yubashiri at the grave. Nami gets a Vivre Card from Lola, which points the way to Lola’s mother, a pirate in the New World. Luffy takes out the piece of paper he received from Ace, which is also a Vivre Card, and learns that as it is burning and shrinking, Ace’s life is in danger. Believing that Ace can get out of trouble on his own, Luffy decides to head onward rather than go to rescue him, and the Straw Hats sail away from Thriller Bark. As the Luffy and his crew sail away, three enormous and mysterious figure appears in the fog, looking over Thriller Bark.